I read a book not too long ago called The Science of Shakespeare by Dan Falk. It was a lot of fun, delving into both Hamlet and some of Shakespeare’s lesser-known plays, as well as the accelerating pace of science before, during, and after Shakespeare’s time. Truth be told, however, the actual links between Shakespeare and the science of his time are pretty thin. While Shakespeare of course had an amazing intellect and a deep curiosity, I think the most reasonable assessment has to be that Shakespeare wasn’t particularly interested in science. But the beauty of Symphony is that I’m not limited to only one kind of music. I can love Shakespeare and science – and I do. Today I’m going to tell a story – certainly not worthy of the Bard, but I hope you like it, anyway – about how we got to now. Now, in case you haven’t been watching, is the time when we humans will complete the initial reconnaissance of our Solar System by visiting tiny Pluto. Planet or not, Pluto is among the last of the major objects in the Sun’s family to receive a visitor from Earth. 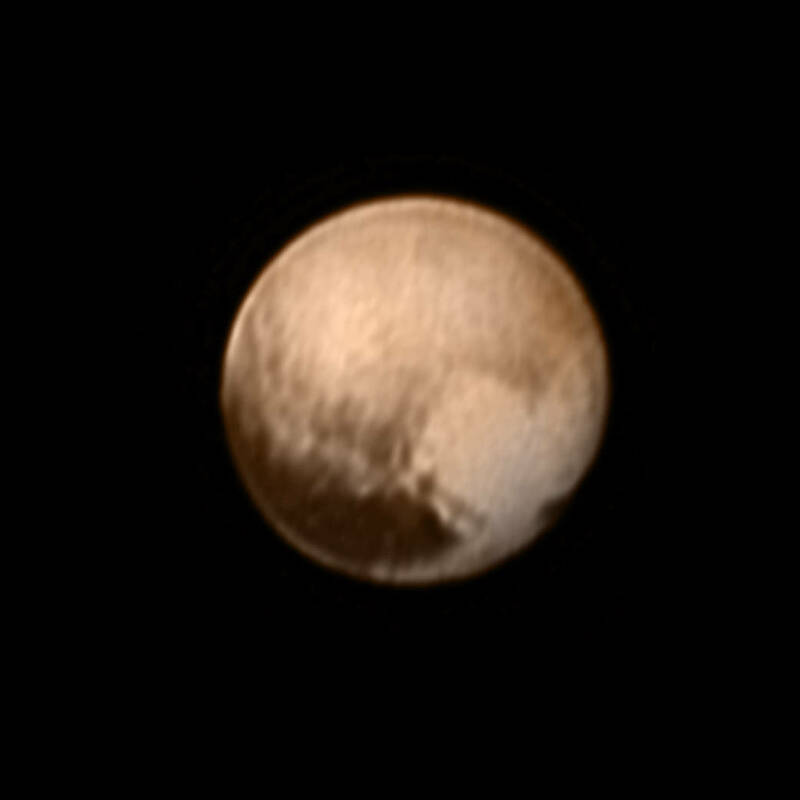 As we watch these close-up pictures of Pluto fill our computer screens, let’s think about how we got here. Long ago, people noticed the stars. 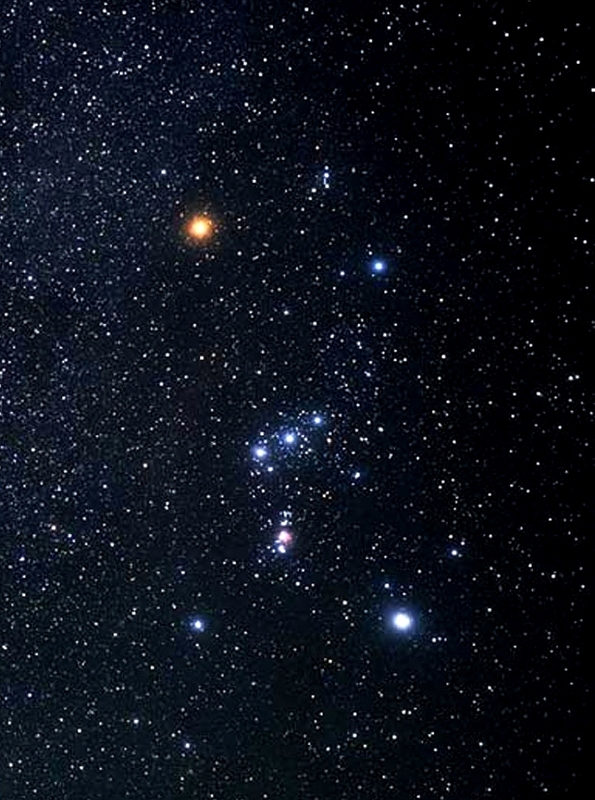 No one knew what the stars could be, but that didn’t prevent us from making up stories. The stars were holes in a blanket, revealing a fire behind. They were milk, squirted from the breast of Hera. They (according to Jim and Huck) were eggs, laid by the Moon across the sky just as a frog might lay her own eggs in the river. Clever as they were, none of the stories came anywhere near the massive truth that stars were enormous nuclear furnaces in whose chaotic centers the elements of our very own bodies are forged. Science got us that story, and lots more besides. People named the planets after their gods. The lovely morning and evening stars were, once they were found to be the same object, named after the goddess of love. The bright and stately planet that moved over the full sky was the king of the gods. The reddish world was the god of war. But what were they, really? In 1609 Galileo pointed a new device toward the heavens and saw that the planets were more than just lights in the sky. Venus, not just the goddess of love, was also a world that, like our own Moon, passed through phases of light and dark. Warlike Mars didn’t show phases, but unlike the stars it formed a disk in Galileo’s telescope. And Jupiter, the god king, was not a single world but five, with the four smaller ones circling round and round the central disk (this, incidentally, was a discovery so momentous that even Shakespeare may have referenced it in his play Cymbeline – a work I look forward to reading soon). Next came the discoveries of Kepler, who found that the orbits of the planets followed strict mathematical rules, and Newton, who explained those rules with an elegantly simple law. Every time an apple falls from a tree it follows the same law that keeps all the worlds of the Solar System in orbit around the Sun. Later we were able to use those same laws of motion to discover planets and other worlds we couldn’t even see with our eyes! Uranus was revealed due to its invisible influence on Saturn. Neptune showed up when it pulled on Uranus (ok, stop giggling). The story would be perfect if only Pluto had also shown up due to its gravitational tug on Neptune. Sadly, Pluto’s discovery was actually an accident. Mathematical errors in the calculations of Uranus’ and Neptune’s orbits led scientists to expect another large planet in Pluto’s place. Instead, and mostly by accident, tiny Pluto happened to be in the right place at the right time, showing that even scientists need a little bit of good luck sometimes. For thousands of years, people wondered about the planets. But the discoveries of Galileo, Kepler, Newton and their followers let us not only learn what the planets are, but actually travel there. In less than 24 hours, New Horizons will zip along its Newtonian trajectory, flying past a world that Newton’s genius (and a few math errors) helped us know. William Shakespeare died 399 years ago. It seems unlikely that we’ll ever have another new Shakespeare play to read, view, and enjoy. And yet each of us can discover Shakespeare’s plays, and then re-discover them, for ourselves. Most amazing to me is Shakespeare’s utter refusal to be pinned down by a moral, a philosophy, or even (as George Bernard Shaw points out) a conscience. Nothing is ever simple in Shakespeare – villains like Macbeth and Iago are delicious and deep, while even the purest of heroes, Henry V and Edgar, are deeply ambiguous. My discovery over the past week has been a play I knew essentially nothing of until I started reading it – the extraordinary Measure for Measure. In this play, no one is likeable. Yet a great many characters are deeply memorable. The morality of the play is not our own, but neither is it the “official” morality of Shakespeare’s time. Rather, it is very human – bawdy, hypocritical, struggling to be rational and as a result becoming all the more irrational. It is a deeply sexual play, a violent play in which virtually no violence is actually shown, a play with an ending that is so awkward and unsatisfying that you feel as though you’ve been somehow duped and yet, in a certain sad sense, deeply enlightened. The most intriguing character in the play is certainly Isabella, sister to the condemned Claudio. When Claudio’s fiancee Juliet becomes pregnant, Claudio is sentenced to death to serve as an example and rein in the rampant immorality found in the city. Isabella goes to Angelo, the acting ruler of the city, to beg for her brother’s life, only to be told that she herself must surrender her body to Angelo or see her brother not only killed but tortured, as well. The most interesting, and disturbing, struggle in the play becomes how Isabella chooses to deal with this turn of events. Cold and virtuous, Isabella is irresistible to the men she encounters, and in the end this leads to what I see as her personal tragedy. Or maybe not. Or maybe the tragedy is within her all along. Or not. It is a fascinating play, and has instantly become one of my favorites. It’s a pleasure to live on a planet where I can still discover a Measure for Measure.